As the hardware engineers cram more and more cores into the processors, software engineers are left to ponder about how to best exploit these new capabilities. Intel offers an open source C++ library they call Threading Building Blocks (TBB). Akin to competing solutions (OpenMP, GCD, PPL), the library allows the developer to break up the computation into bite size pieces called tasks. A task also has a successor (or parent) task which makes it possible to express a relationship describing who should run before whom. The library runtime then takes care of scheduling the tasks onto the physical threads. It is, however, error prone and inconvenient to program using the tasks. Thankfully, much of the programming can be expressed via higher level abstractions (especially those involving fork-join parallelism). For example, parallel_for function allows for using multiple threads to execute the iterations of the loop. Another example is parallel_pipeline function which allows for expressing pipes-and-filters kind of parallelism. I first encountered Boost.Proto at the Extraordinary C++ conference in 2007. Eric Niebler, the author of the library, gave a presentation to an awestruck audience where he took C++ metaprogramming to a level not seen before. In 2010, Eric wrote a series (1, 2, 3, 4, 5, 6, 7, 8) of articles on the subject that were published on C++Next blog. Through this wonderful series, I was finally able to start wrapping my head around Boost.Proto. The library is actually designed for library writers, more specifically those that are interested in developing an embeddable DSL inside C++ programs. I am not going try to give a tutorial of Boost.Proto in this post. If you have not yet done so, I highly recommend reading the aforementioned articles. What I hope to do is document my experience of using Boost.Proto for this exercise. 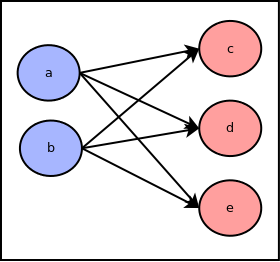 We will write the left graph as a > (b + c) and the right one as (a + b) > c. Since when I see graphs like this, I tell to myself "a goes to b and c" and "a and b go to c", this syntax seems reasonable. And since in C++ the addition has higher precedence than greater operator, the parenthesis can be dropped: a > b + c and a + b > c. Let's use this syntax to express the graph in the original example: start > (a > e + c) + (b > c > d). With the grammar in place, it's time to make it actually do stuff. We need to put in semantic actions, or transforms as Proto calls it, next to each grammar rule. 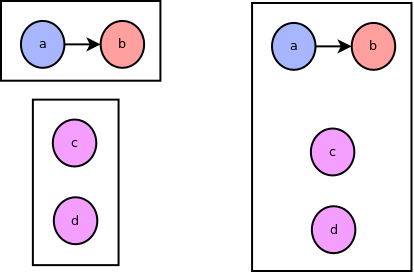 In TBB, each node is both a sender and receiver of messages (and is derived from sender<T> and receiver<T>). As we combine the nodes together using the two operators, we produce a compound node which has some of the nodes inside of it acting as its senders and some as receivers. 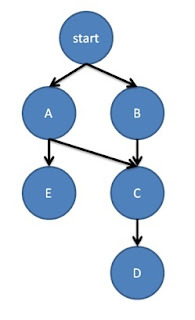 For example, suppose we have an expression (a > b) > (c > d > e) and we have independently build up two compound nodes, (a > b) and (c > d > e). We now join the two using the > operator. The > operator splices together the left-hand's senders with right-hand's receivers. In the diagrams below, the box represents the compound node, the receivers are colored blue, the senders are colored red and nodes acting as both receivers and senders are colored purple. For the example above, the following diagram illustrates the before and after the splice. Note that while 'a' is sending messages to 'b', it is actually the receiver of the compound node. A big thanks goes to Neil Groves for reviewing this article. Very nice work! I enjoyed reading your code and explanation and the link you have made between Proto and TBB Flow Graph. Thanks.